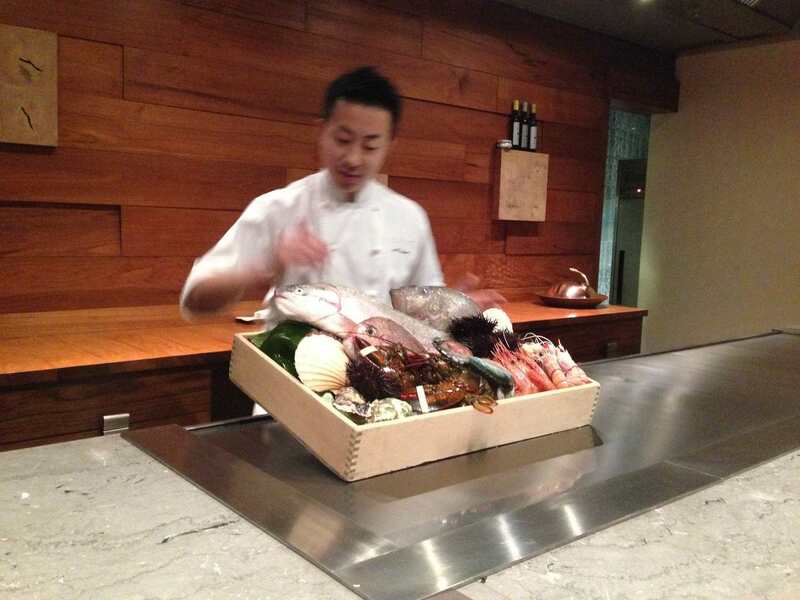 I have been living in Singapore for over 5 years and it took me 3,5 to make it to Waku Ghin, Singapore’s celebrity chef restaurant specialising in rare seafood and premium meats from Japan and awardee of one Michelin star since 2016. 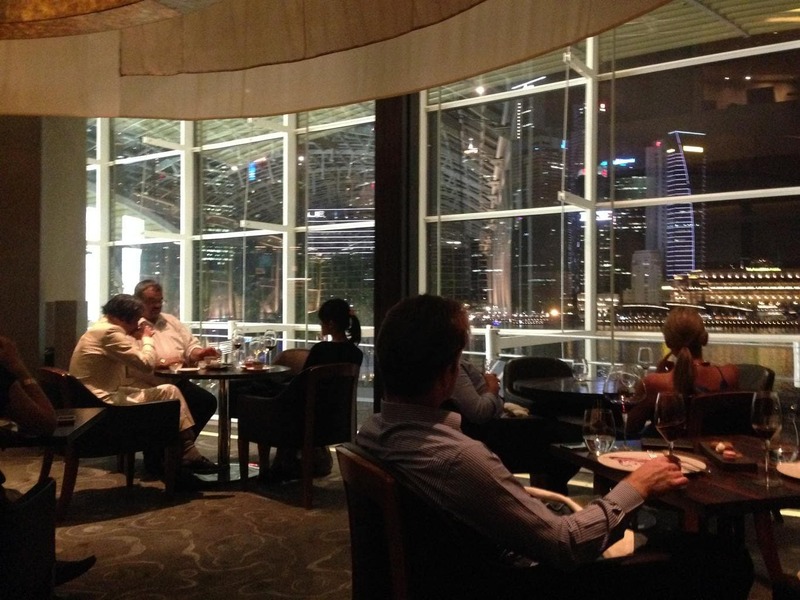 Fine dining in Singapore is extremely expensive. Your bill for a tasting menu with wine pairing is easily $800 per couple, it is almost as if there was an unspoken rule, a cartel of sorts by the top finest restaurants in the city, to fix prices. It is easy to lose perspective about what high-end cuisine should be worth. Occasions to try out these places don’t come by often because I find it very hard to justify such obscenity to myself, but since I had just got an offer for a new job I thought this was the chance to finally make that reservation. 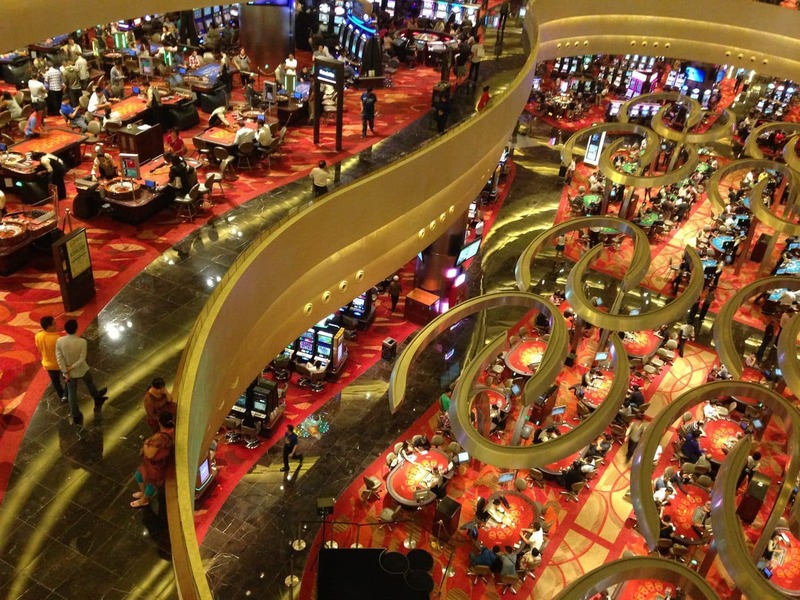 Arriving at Waku Ghin requires a walk through the Marina Bay Shoppes and by the casino, impressive from the balconies above. It is a slightly dressed down arrival for what’s to come but it goes in line with Waku Ghin’s understated aesthetics. Waku Ghin only takes 25 diners per seating, at two set times and split into several rooms, for their 10-dish degustation menu. Everyone seats at the counter facing the chef who prepares most of the dishes in front of you on the very high-end tepanaki. In most cases, it simply assembles the ingredients, because a lot of the dishes don’t require any or very little cooking as they are eaten raw. In other cases it fully cooks the dish from cradle to grave. There is anotehr sous-chef helping him out. In our room there was only another couple seated next to us. The ratio of staff to customer is an impressive 1:2, not bad for a restaurant, and we were welcome to interact with them at any point. As soon as we were seated we were given the set menu and the wine list. The menu was ours to keep and stayed on the table for the duration of the meal so we could refer to it at any time. In true fine-dining style the wine list is tremendously long. And equally pricey. I knew the menu was $300 per person and had assumed that we could get a bottle of wine for under $100 to split so with taxes and service charge we would be at about $400 each. When I started to look at the wine list I realized the cheapest wines were around the $150 mark and there were very few of them (as in less than 10 perhaps). The list quickly exploded in prices and there were plenty of wines for over $1,000. I recognized a few of the cheapest wines and knew they cost $20 at the supermarket back home. Restaurants tend to mark up wines significantly but Waku Ghin had taken this to a whole new level. I was annoyed, it was a clear rip off and I felt that we were taken hostage. It was not a good start. We ordered two lychee martinis to aid in the decision. I debated whether I like lychee martinis for the lychee or the martini. Alas, it does not matter. Of course, we could have decided not to get any wine and simply eat our meal but once you pay $350 for a meal you truly want to enjoy it to the fullest and there is no good meal without a good wine. In my humble opinion. We discussed what to do for a while and eventually decided that, since we were going to spend a significant amount we should simply go for the wine pairing. For $200 we would get 6 wines to match each dish so we would have the full experience. So that’s how we ended up with a bill of $600 each. Except for one dish the entire menu was seafood based. That is, rare and incredibly precious seafood prepared very simply, fresh and with few touches of grace. We started with a fresh oyster each. I will not lie, I do not like shellfish and I had never eaten an oyster before. 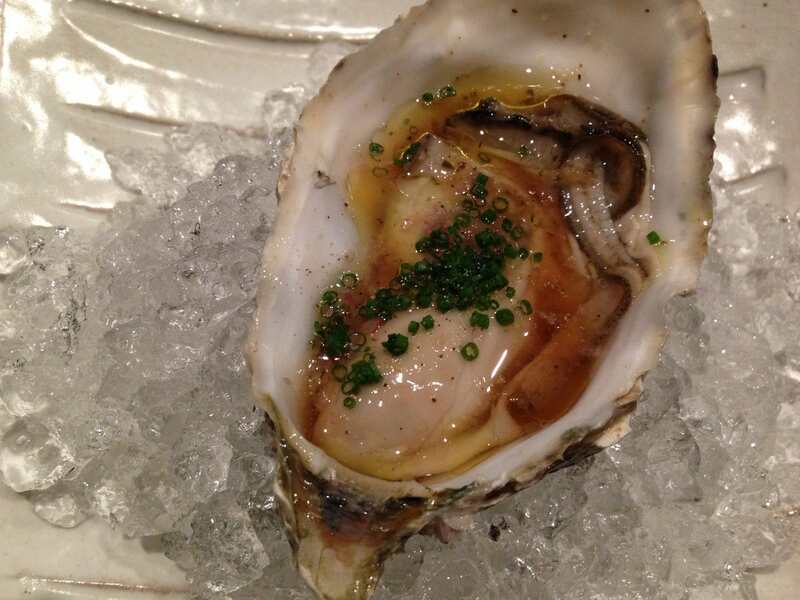 Now, considering the price tag, I estimated the oyster was probably worth $50 and I was not going to let it go to waste so, there, I ate it, and I will admit that it was not bad, I would not go as far as to say that it was orgasmic, I had nothing to compare it to after all, but it did not have the fishiness that I had feared and it was pleasantly tasty. My dining companion loved it, and he had had them before so I presume we kicked-off the evening on a high note. After the oyster we were graced with the thinnest, freshest slices of tuna sashimi. The fish was very tasty and fatty but there wasn’t too much behind the quality of the raw materials. A yuzu dressing enhanced the taste and it was delicious, deliciously simple. The chopsticks we are given, although mere wood, had been dipped in water so the texture of the wood amplified the taste of the food. Waku Ghin does earn points for the smallest details like this one. 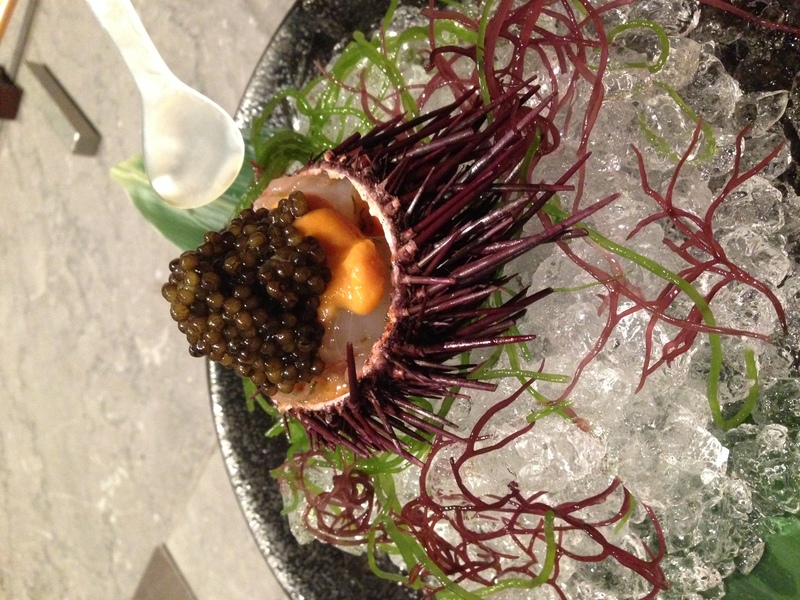 The third dish featured the signature Marinated Botan Shrimp with Sea Urchin and Oscietra Caviar. We were given tiny mother of pearl spoons to eat this one, which, I researched later, was so that the flavor of the caviar did not get modified by the steel of regular cutlery. Sadly, I don’t eat sea urchin so mine was missing the star of the dish. My friend said it was nice, but we were not blown away like most other customers. Or maybe most people write about it as a near-out of body experience because everybody does. It did look pretty and it was as fresh and raw as it gets. It was also extremely appealing to the eye, its colors exquisitely balanced. The urchin shell looked so perfect that it looked unreal, its contradicting soft beauty made it seem artificial. We got a glass of sake from the Katoukichibbe Shouten brewery to go with it. Chef Tetsuya is the only Sake Ambassador appointed outside of Japan so the sake was indeed great. 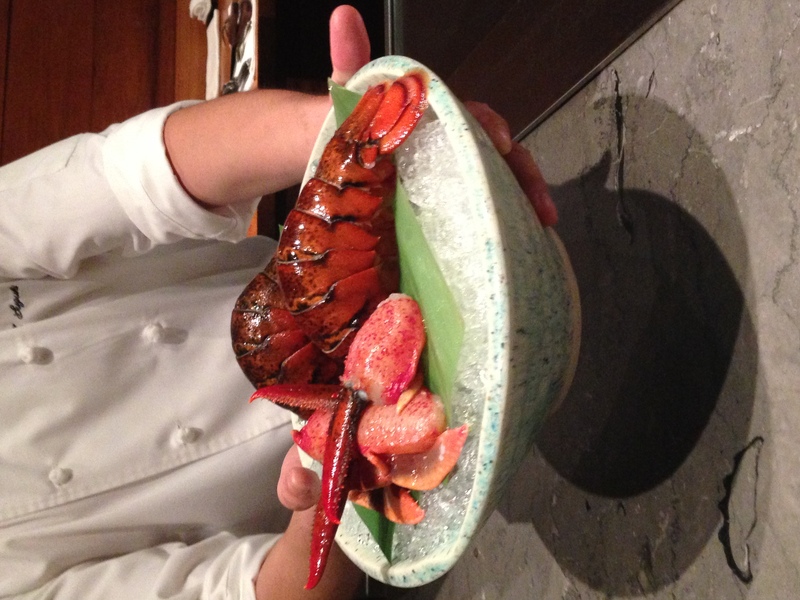 A touch for a French-Japanese degustation menu. 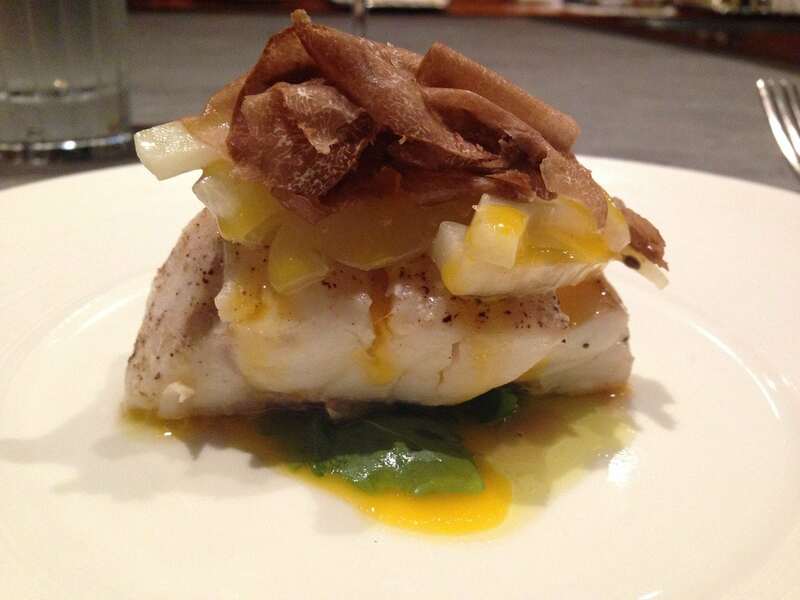 Next up was the fish with shaved truffle. 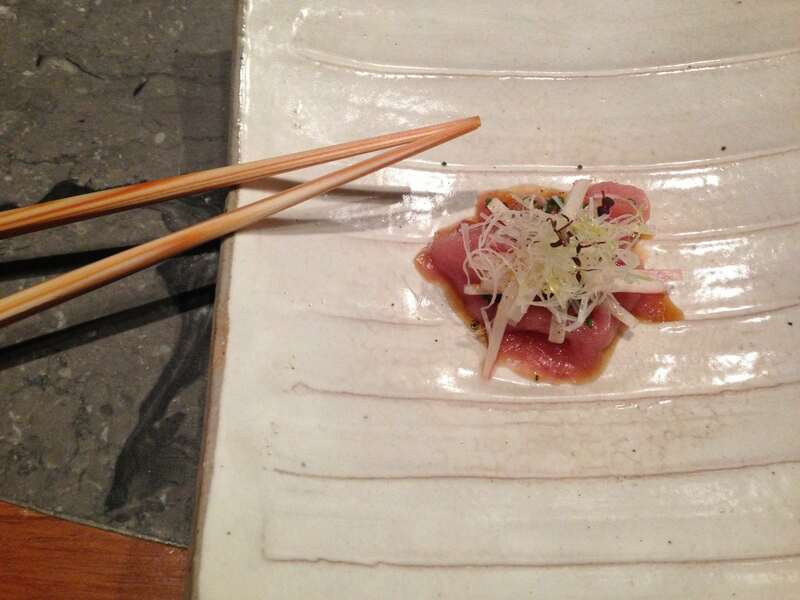 I can’t remember at all what sort of fish it was and I have not seen this dish on any other review or post online, not a single one, so I can only imagine it was one of the chef’s recent creations. It was tasty and fragrant with the smell that makes truffles so valuable in the kitchen but it wasn’t something to write home about. Following on the seafood was the Alaskan king crab. I am not a massive fan of crab but this is some truly special dish and, for a change, the preparation, in front of our eyes, was quite theatrical and sophisticated. The chef made a little mountain of salt on a pan and added the crab legs on top then covered it with a bambo leaf and the lid and let it cook for a very brief time. We got the meat out of the shell, it would not have been very fine dining to expect us to fight the shell ourselves, as if we were eating chili crab at any of the outdoor river eateries. The crab was delicious, even to a virgin like me, I am now a convert. You can watch the video of the preparation. 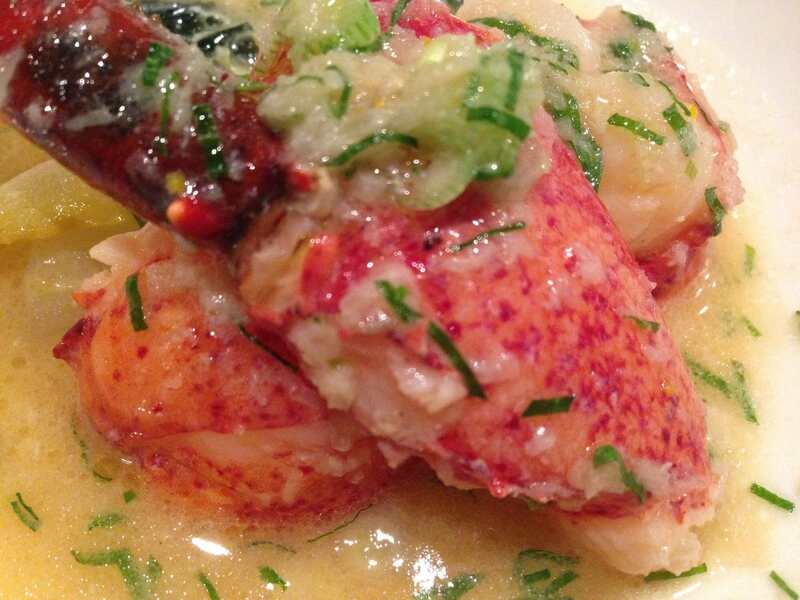 The seafood bonanza continued with lobster tails so fresh that you could still taste the ocean. He lightly cooked the tails on a small saucepan and then prepared a beautiful sauce. This was a very accomplished dish and, like with all the rest, the seafood was the highest quality you will ever taste. By that point I was already pretty tipsy as we had been getting a generous glass of wine or sake with every dish and we were already on our 6th. Plus the lychee martini to warm up. 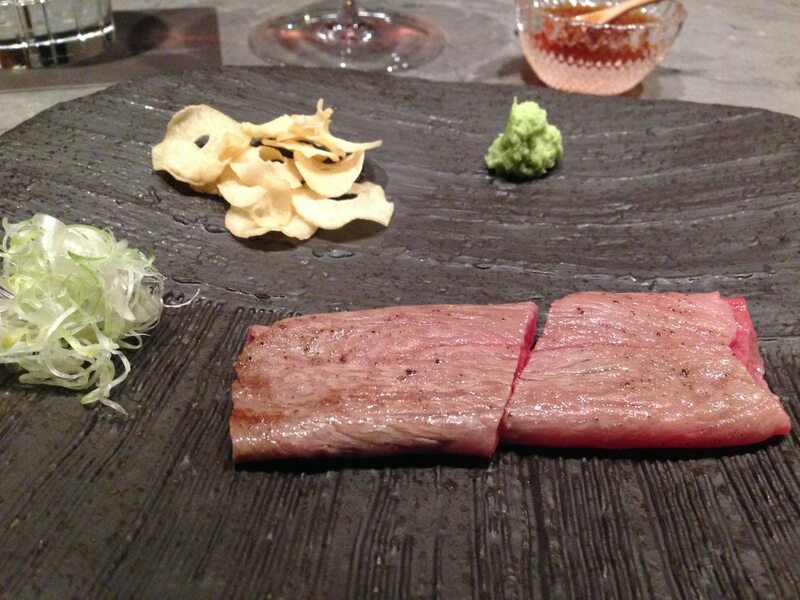 The most memorable part of the meal was the Wagyu beef with Wasabi and Citrus Soy. This was some seriously amazing meat. I have never tasted something as soft and flavorful as these slices of perfectly seared meat. They came in thin pieces and we could have as many as we wanted. They were juicy and delicious, a spectacular dish which was so simply prepared that it no doubt showed the skill of the chef and the quality of the ingredients. The meat was rolled and seared very lightly. The fat marbles were incredibly delicate. Despite we could order as many slices as we wanted, by that point we were quite full as this was the last dish. The meat was paired with a bottle of Italian Barbaresco. Lastly, we had an unexpected consomme with rice or noodles. We were asked whether we preferred one or the other. 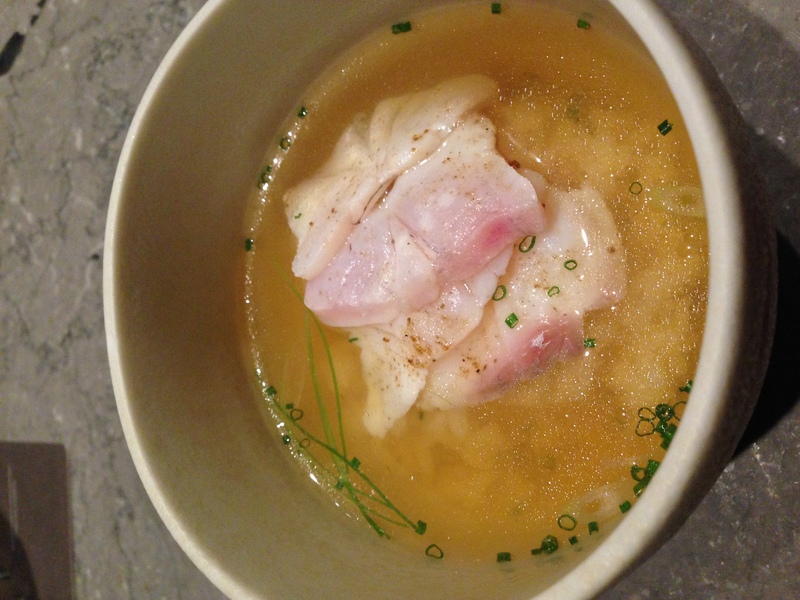 This was a very clear soup with snapper slices and bottomed with the chosen starch. It was a sort of palate cleanser as its flavors were sweet and neutral. After the savory dishes we were invited to the main dining room for a sweet ending. The dining room has views over the marina and the Fullerton Hotel and a classic international hotel chain decoration: thick carpets, glass and plan small tables and armchairs. The meal ended with two desserts. 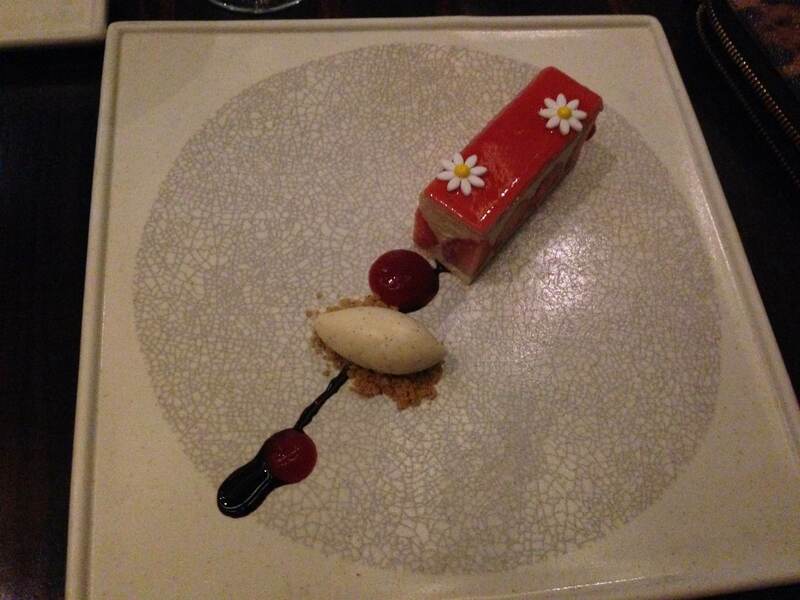 Firstly, a vanilla ice cream on a sorbet bed followed by a creamy strawberry mousse cake. They were both delicious and full of detail but nothing extraordinary. The meal was finished off with some petit furs that, I read on other forums, could also be packed up to go if you are too full. 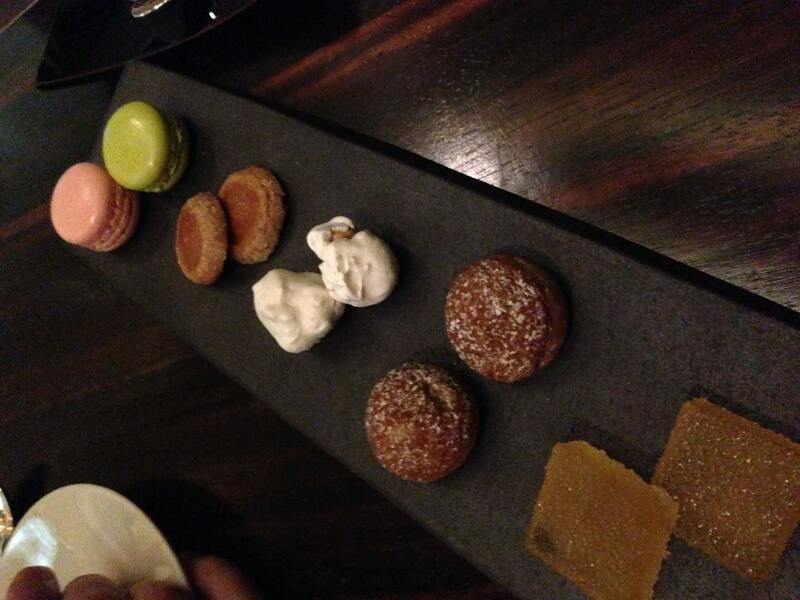 There were little macarons, tea biscuits, nougats, tangerine jellies. Small bites to accompany the coffee if you have it. I had read a lot of reviews mentioning that you are offered a cup of very precious green tea before setting off for dessert but we were never offered that. It is important to note that the menu changes regularly but some of the dishes are always present. 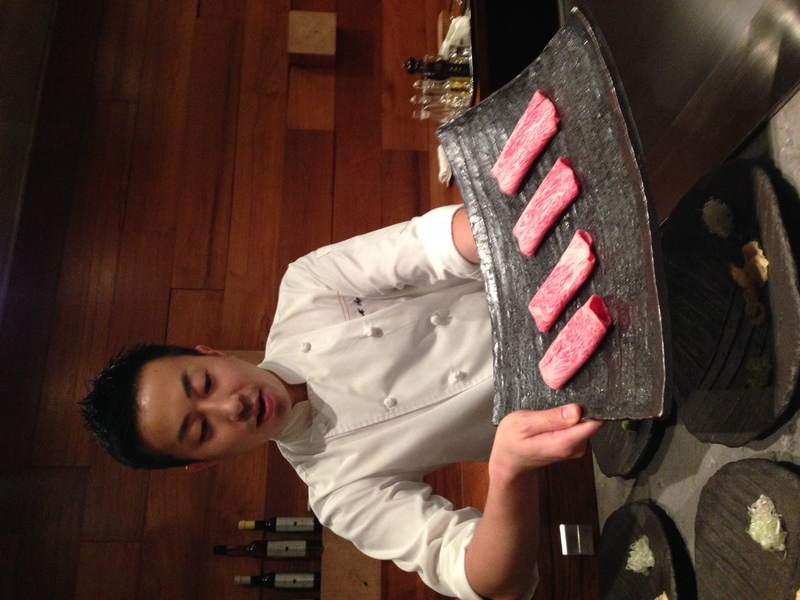 the Wagyu and the sea urchin are part of the signature dishes and always feature. You can arrange your preferred dishes in advance when you make your reservation to ensure that some of the chef’s delicacies are served. After all, for the price you pay, you should be able to fully customize your dinner. In true Japanese fashion the decoration of the restaurant is bare. The bar is in an orange color wood and we were sitting on high stools. The hallways have glass walls and the main dining area where we took our desserts had carpeted floors, a large window looking into the mall and the marina and a wall covered with a vertical wine cellar. There was barely any decoration around. It did not feel cold or warm, just as bare and simple as it can be. Except for the desserts most of the dishes were prepared and served immediately by the chef over the bar. There is staff that takes care of the drinks and the wine pairing who appeared only to pour us the next one. We were given perfect explanations of everything that went on and the personalized menu was a good guide to walk us through the meal. The interaction with the chef was seamless and friendly. He was Japanese and talked to us before every dish was served. We got a master lesson on food preparation and precision right before our eyes. The theatrical show that was performed went a long way to make the evening feel special. I struggle to give an answer. I guess it goes a long way to say that I would not return. Partially because I am not such a seafood fan and so I can’t appreciate such extraordinarily rare and skillful preparation. Partially because the wine pricing situation truly made me feel taken advantage of and this is not a good feeling when you are spending such sums. And obviously, who am I fooling, the price tag means this is a once in a lifetime experience. But the type of food being served is also clearly not my type. I enjoy much more dishes which require preparation and are made with the labor of love than extremely precious ingredients. The value for money equation just did not work for me and I would be hard pressed to recommend this to any friend. If you want to splash on a special meal Singapore has other more affordable (although still pricey) fine-dining options.